Visit time at Petronas Towers is 7:15 pm. Tickets will be delivered to your hotel reception one day before tour. If there is a minor change of 15 minutes we will notify you by emails & whats app. Visit time at Petronas Towers is 6:15 pm. Tickets will be delivered to your hotel reception one day before tour. If there is a minor change of 15 minutes we will notify you by emails & whats app. Visit time at Petronas Towers is 11:15 am. Tickets will be delivered to your hotel reception one day before tour. If there is a minor change of 15 minutes we will notify you by emails & whats app. Visit time at Petronas Towers is 8:15 pm. Tickets will be delivered to your hotel reception one day before tour. If there is a minor change of 15 minutes we will notify you by emails & whats app. Visit time at Petronas Towers is 10:15 am. Tickets will be delivered to your hotel reception one day before tour. If there is a minor change of 15 minutes we will notify you by emails & whats app. Visit time at Petronas Towers is 5:15 pm. Tickets will be delivered to your hotel reception one day before tour. If there is a minor change of 15 minutes we will notify you by emails & whats app. Visit time at Petronas Towers is 4:15 pm. Tickets will be delivered to your hotel reception one day before tour. If there is a minor change of 15 minutes we will notify you by emails & whats app. Visit time at Petronas Towers will be 9:15 am. Tickets will be delivered to your hotel reception one day before tour. If there is a minor change of 15 minutes we will notify you by emails & whats app. Visit time at Petronas Towers is 1:15 pm. Tickets will be delivered to your hotel reception one day before tour. If there is a minor change of 15 minutes we will notify you by emails & whats app. Visit time at Petronas Towers is 12:15 pm. Tickets will be delivered to your hotel reception one day before tour. If there is a minor change of 15 minutes we will notify you by emails & whats app. Visit time at Petronas Towers is 3:15 pm. Tickets will be delivered to your hotel reception one day before tour. If there is a minor change of 15 minutes we will notify you by emails & whats app. Visit time at Petronas Towers is 2:15pm. Tickets will be delivered to your hotel reception one day before tour. If there is a minor change of 15 minutes we will notify you by emails & whats app. Choose the time you’d like to visit the Petronas Twin Towers—after booking, the tickets will be delivered to your hotel’s reception for maximum convenience. Make your way to the towers on your own, then walk right past the long lines for purchasing tickets to the Observation Deck. Board an elevator for the smooth trip to the 86th floor, where panoramic windows offer an unmatched perspective on Kuala Lumpur. 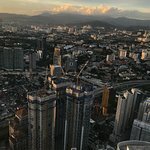 The Petronas Twin Towers were once the highest skyscrapers in the world, and their elegant profile has become an icon of Kuala Lumpur, stretching to 1,483 feet (452 meters). 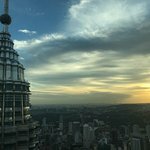 If you opt for a visit at sunset, you’ll watch warm light illuminate the city, and nighttime trips to Petronas Twin Towers look out on a glittering skyline. 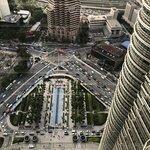 And at the base of Petronas Twin Towers, the sprawling KLCC Park has walking trails, a playground, and a fountain that lights up after dark. Please note: Tickets are non-refundable and cannot be changed after booking. Get quick answers from Skip-The-Line Petronas Twin Towers Tickets With Free Hotel Delivery staff and past visitors.